Tent and Table is your #1 distributor of commercial party tents for sale. We offer a large selection of high quality, heavy-duty party tents, tent sidewalls and tent parts and accessories. Our mission is to provide you or your party rental business with the best commercial tents, party tents and tent accessories at an affordable price. From tent setup to teardown, Tent and Table carries all your commercial party tent needs. Looking for a wedding tent, event tent or party tent for sale? Browse through our large selection of commercial tents -- from high peak frame tents, premium pole tents, standard pole tents, West Coast Frame canopy tents, Oxford Speedy pop up tents and more. Our commercial party tents are great for graduations, backyard parties, outdoor catering events, lawn advertising and more. Already own a commercial tent? Keep it well maintained with our tent anchors, tent repair, tent repair kits and accessories, tent sidewalls, frame tent gutters and more. Proper tent maintenance can drastically extend the life of your commercial tent. Have questions about proper tent maintenance? 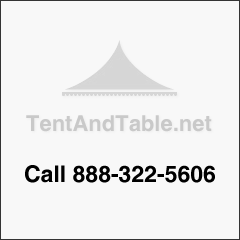 Give us at call at 1-888-322-5606 to speak with an experienced Tent and Table commercial tent specialist today! Choosing an affordable party tent that suits your needs has never been easier! Whether you’re in need of a pop up tent, canopy tent, event tent, outdoor tent or wedding tent, we have the perfect commercial tent for you! Our pole tent sizes range from: 10x10, 10x20, 20x20, 20x30, 20x40, 30x30, 30x40, 30x60, 30x80, 30x100, 40x20, 40x40, 40x60, 40x80, 40x100, 60x60, 60x90, 60x120, 60x150 and other sizes.